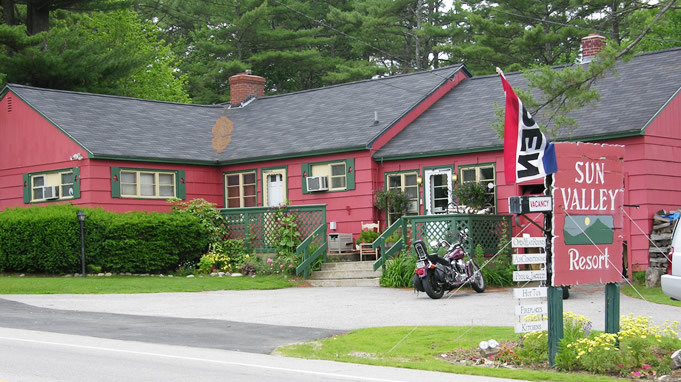 Quality Lodging in Weirs Beach NH for Over 78 Years! Sun Valley Cottages is located in the center of the famous New Hampshire Lakes and Mountains recreation area. There are many family activities and amusements, restaurants and gift shops within walking distance of the cottages and condominiums. With just a short walk you can visit Funspot, The Broken Spoke and the Looney Bin! Beautiful Lake Winnipesaukee and its surrounding scenery is the backdrop for the travel hotspot in Weirs Beach. Boasting a rich history, shallow sandy waters, arcades, shops & outlets, boat cruises and so much more, it's just about impossible to run out of things to do. With just a short drive, you can visit Ellacoya State Park, Bank of NH Pavilion, the New Hampshire Motor Speedway, Gunstock Ski Resort & Recreation Area, the White Mountains, Castle in the Clouds, Polar Caves and other features of unsurpassed beauty. Visit our links page to get more information on nearby attractions and places for daytrips. We have a variety of different sized cottages for rent, some with wood burning fireplaces. We offer different sized cottages and condominiums in four distinct locations, along Route #3 in Weirs Beach. We are centrally located in the Lakes Region of NH and have many amenities for you to enjoy on site, including a pool, hot tub and horseshoes.